(Bloomberg) -- South Africa’s main opposition party expects to overcome a slump in opinion polls and benefit from the emerging claims of graft during Jacob Zuma’s presidency as it seeks to boost its chances against the ruling African National Congress in general elections in May. Until the most recent investigations and testimony at a inquiry into state graft that implicated government officials and business people involving billions of rand, opinion polls had showed a massive slide in the DA’s support. A poll of 3,571 adults published last month by research company Ipsos indicated the DA would garner 14 percent of the vote and the populist Economic Freedom Fighters 9 percent. The ANC, which had dominated South African politics since the end of apartheid in 1994, was seen winning 61 percent. 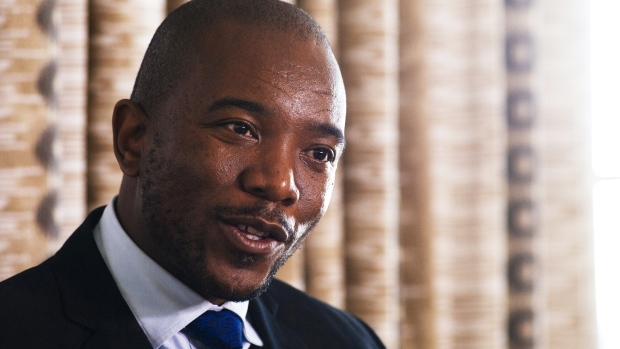 Maimane said the party’s own surveys show it will win a bigger share of the national vote in May 8 elections than the 22 percent it secured five years ago. He rejected suggestions that infighting and several public-relations blunders may have cost the DA support. Read more about the infighting that’s been plaguing the DA. In its best performance, the DA won 27 percent support in a 2016 municipal vote and enlisted the help of the EFF to wrest control of Johannesburg, the economic hub, and the capital, Pretoria, away from the ANC. Backing for the ANC slumped to a record low of 54 percent in that election, mainly due to disgruntlement with Zuma’s scandal-marred tenure. Yet municipal votes are not necessarily indicative of how parties will perform in national elections. “Our own internal polls show us that the popular opinion in favor of Ramaphosa peaked in February last year,” Maimane said.